A revolution in tip calculating. Just spin, tap and tip. 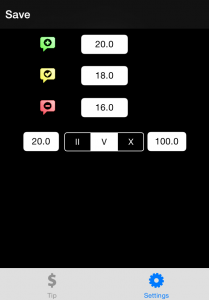 Tigl is a tip calculator built for speed and simplicity. Let’s face it, we all know how to calculate a tip, but when it’s late, or we’re tired, sometimes we don’t want to go through the hassle. Tigl will get you to an approximate tip quickly and you can tweak it from there. 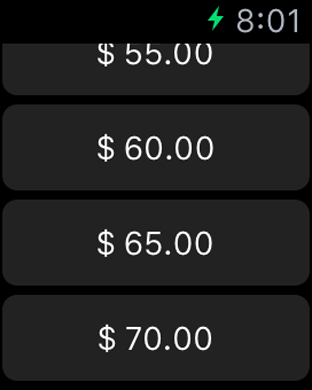 The main Tigl screen displays a scrollable list of approximate amounts for a tip calculation. 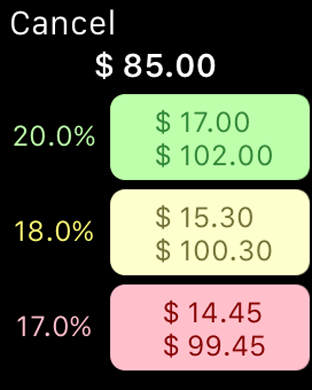 Tap on the desired amount and Tigl will present the tip options based on your preferred tip percentages (entered via the iPhone app). – We are creatures of habit and typically tip at the same percentage for various levels of service (good, fair, poor). Tigl allows these to be configured in advance on your iPhone and changed as your mood suits. – You may be a mathematician on the job, but sometimes you want to give your brain a rest. Tigl is designed to get you as close as you want (within $2) to your actual amount, and you can figure out the rest from there. 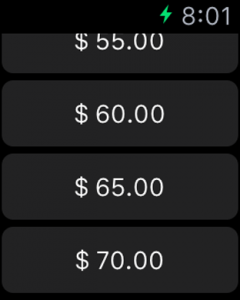 – Who wants to sit around tapping on their wrist to determine an appropriate tip? 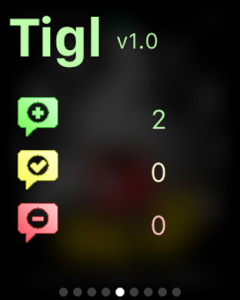 This app was designed from the ground up to be functional and fast on a watch. We’ve reimagined tipping for speed and simplicity, sacrificing a little precision. Set your tip percentages for Good, Fair and Poor service. Set the scrollable dollar amount from a minimum number to a maximum number. Tigl provides a Glance on the watch to show how many tips you’ve given at each level of service.